NBGGrabBag: New York Times - The Bicycle is Saving the City!! 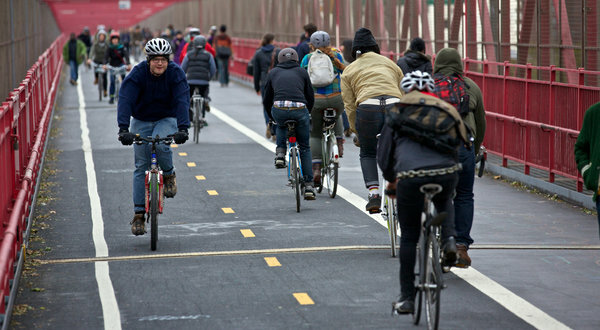 In post-storm New York, the bike is having a moment of sorts. With subways still not running under the East River or between Lower Manhattan and Brooklyn, traffic snarled in many places and lines for buses stretching for blocks, many people in Brooklyn took to bicycles on Thursday to get where they had to go. “I’m extremely glad I have a bike right now — it’s one of the best assets you can have,” said James Emery, 22, who was riding on Thursday afternoon from Williamsburg to Red Hook to help a friend whose screen-printing business had been flooded. Thomas Jarrels, 46, who biked home to Crown Heights from his job as a sous-chef at a Midtown law firm, said he was glad to have had an impetus to bike to work. He said he was a bike messenger in the 1980s and loved biking, but had never commuted by bike until the storm disabled the subway. Though it took slightly longer than the train, he said, he thought he would keep biking even after the subway started running again. But David Pimentelli, 42, said that biking in some areas of Brooklyn had been frightening on Thursday, with drivers waiting anxiously in long lines for gas and little police presence.